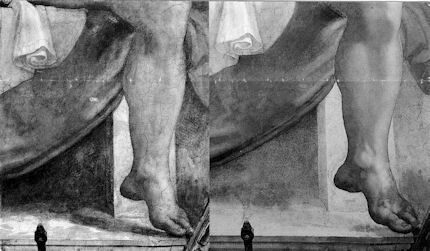 The left foot of Michelangelo’s Jonah on the Sistine Chapel ceiling, as it was before restoration (left), and after restoration (right), in the course of which the shadow cast by the foot was removed. Note the loss of other shadows and the changes that occurred to the design of the draperies. Someday, the Eliots’ film (made for ABC Television) might be re-shown, but meanwhile, Alexander Eliot’s testimony is now on the record in a new full-length film/DVD biography, A Light in the Dark: The Art and Life of Frank Mason, in which he and other early campaigners against the restoration (including the late painter, Frank Mason, and the late Professor James Beck) are given voice on the Sistine Chapel restoration. Not least of the delights among this film’s precious and historical footage, are Tom Wolfe’s account of his lessons in Frank Mason’s painting classes at the Art Students League, New York, and the sight of the former Metropolitan Museum of Art director, the late Thomas Hoving, belligerently boasting that he himself had helped sponge from the ceiling the “filth” that was in truth the last stages of Michelangelo’s painting. The 500th anniversary of the completion in 1512 of Michelangelo’s Sistine Chapel ceiling paintings has gone almost entirely un-celebrated. On October 31st, in a small “in-house” service marking the 500th anniversary of Pope Julius II’s service celebrating the completion of the ceiling, Pope Benedict XVI asked a group of cardinals, Vatican employees and guests to imagine what it must have been like 500 years ago, adding that contemplating the frescoes renders them “more beautiful still, more authentic. They reveal all of their beauty. It is as if during the liturgy, all of this symphony of figures come to life, certainly in a spiritual sense, but inseparably also aesthetically.” Apologists for the transforming 1980-90 restoration of the ceiling are nonplussed by the missed opportunity for a mega-beano half-millennium art celebration.